Christmas Music for Children, and Adults. 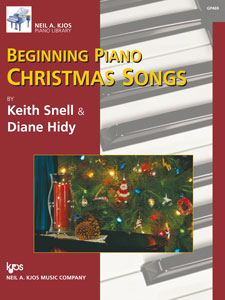 Fine arrangements of traditional Christmas Carols by Diane Hidy and Keith Snell. Students enjoy comparing the two covers - the holiday books have the Piano Town world transformed and they notice every detail. How many differences can you spot? When I was a little girl our family hosted an annual neighborhood Christmas caroling party. My father, a Lutheran pastor, would pull out his trumpet and lead us as we went from door to door singing for anyone who would listen. My piano teacher, who was Jewish, always received special attention. The evening would conclude with hot chocolate and Christmas cookies at our house. Ever since then, Christmas music has been special and magical to me. The opportunity to arrange and write these favorites was pure pleasure. Jingle Bells from Piano Primer Christmas. Each Primer selection includes an accompaniment written by Diane Hidy. These charming books include teacher, parent or sibling - friendly accompaniments. These are printed at the top of the page which makes the reading easier for both teacher and student. Note that the solo line is printed on the accompaniment so you always know what the student is supposed to be playing. No more looking back and forth! My father's favorite Christmas Carol was O Little Town of Bethlehem. In his honor, I wrote a haunting, beautiful accompaniment for it. The pieces in this book are a bit harder than the primer, with simple hand position moves and slightly more challenging rhythms. I love teaching Christmas music because it gives so many opportunities to teach the notation for rhythms that students already have heard. In Level Two, the selections are fully realized solo pieces. Fancy enough to be played on a recital, but traditional enough to use for a sing-along. My students love these. This arrangement of Joy to the World is always a favorite. The pieces in Level Three have more sophisticated art and can be used with students of all ages. Deck the Halls from Piano Town Christmas Level Three. I've used this level successfully with many adults. The snazzy introductions make the pieces feel "big" but the arrangements are still quite doable. The Carol of the Bells is always successful and I particularly enjoy teaching this arrangement of Joy to the World which sounds triumphant and truly joyful. Dance of the Sugar-Plum Fairy from Piano Christmas Level Four. This is a recording of me playing my arrangement of Silent Night from Level Four Christmas. Perhaps my favorite of all these books is this Level Four book. It has lovely jazzy harmonies, but is put together with attention to detail worthy of an Attention Grabber piece. I've taught each of these pieces to many adults and teenagers who love them. There are splashes of sophisticated art, but this book is all about the music of Christmas. Suitable for all ages. We created Beginning Piano Christmas Songs for older beginners who wanted to play Christmas music, but wanted it in a refined format. My adults love to use this book, especially when I join them on the duet parts. The clean, polished layout makes it an excellent choice for adults, teens or 'tweens.